Details at the end of this review on how to enter to win a copy of Night Searchers, and a link to purchase the book where a portion goes to help support KRL. Marcia Muller’s Sharon McCone mystery series were my introduction to contemporary mysteries– before that I’d only read Agatha Christie and Sherlock Holmes in my mid teens. I can’t believe her thirtieth book in the series, Night Searchers, has just come out! Life has changed a lot for Sharon since that first case–she’s married, her offices are far more upscale, and she has the resources now of her husband Hy’s high priced security company. But when it comes to work, the life of a PI never really changes–it’s still asking questions, following people, and stakeouts. In Night Searchers Sharon is asked by a lawyer friend to take on the case of a young couple who live in San Francisco’s upscale Russian Hill neighborhood. Their names are Jay and Camilla Givens. Camilla claims that one evening while walking past a vacant lot she saw people in hoods about to sacrifice an infant on an outdoor fireplace. Jay is skeptical, as is Sharon, who is concerned about Camilla’s state of mind. However, she agrees to check into it. Hy and Sharon’s cases cross when they run into each other staking out the same lot. Hy ends up asking Sharon to do some legwork for his case because he is called out of town. A wealthy businessman has been kidnapped so Sharon goes to interview the family and what she hears is not only conflicting stories, but something just doesn’t seem right. The connections between the two cases seem to grow. Both cases end up leading Sharon and her nephew Mick Savage, who works for her, to a shadowy treasure hunting cult called the Night Searchers. One night they covertly join the group for a harrowing night on the town that leads to death for one of the Searchers. On top of the two cases, Sharon is worried about Hy because she hasn’t heard from him. This is a very complicated wonderfully plotted mystery with a lot of interesting twists and turns that keep you guessing until the end. Marcia also brings San Francisco to life for the reader and I very much enjoyed taking the journey to one of my favorite cities. As always, it’s the characters and the writing that keeps me hooked on a series–I love Sharon McCone–she is strong, intelligent, and very capable of taking care of herself–but she also has a soft side–most seen when dealing with her family and friends. I enjoy her very equal relationship with Hy and her quirky staff/friends. 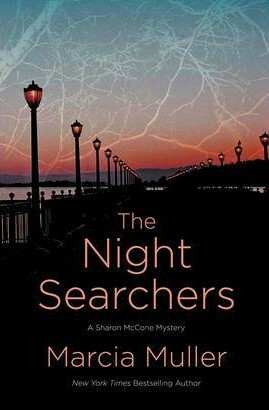 If you are looking for a great mystery, great characters, and an interesting setting, don’t miss Night Searchers. You don’t have to have read the other 31 books to be able to get into the story. I let myself get a bit behind in the series and I was able to jump right in-the mystery totally stands on its own. Now I can’t wait to go back and catch up on those I’ve missed! It is an honor and a privilege to be reviewing one of my all time favorite authors! Watch for an interview with Marci coming soon! To enter to win a copy of Night Searchers, simply email KRL at krlcontests@gmail[dot]com by replacing the [dot] with a period, and with the subject line “Night,” or comment on this article. A winner will be chosen July 26, 2014. U.S. residents only. Marcia Muller is my favorite author. I’m hounding my library until they get this one. Sounds really interesting! Thanks for all the information! I just placed my hold on this at the library last week. I always look forward to a new Sharon story. I love her methodical way of handling cases. I’ve not yet read any of Marcia Muller’s books but would like to check out her work as I do love mysteries (except the one behind my never having checked out the Sharon McCone series … I’ve been remiss!). Marcia Muller is brilliant; as I’ve said before, the time between books is hellish. I don’t know if our shared Detroit beginnings register in my unconscious (her Michigan accent! ), but the fact that we’ve both lived in Northern California for so many years somehow creates a comfort in reading: you’re among family, you know where you are. Adding to that impression is the actual family (families) you come to know reading her books. While I started reading the Sharon McCone series in the middle, I went back and started in the very beginning and read straight through repeating that first one. I could now write Sharon’s biography, but why? Marcia’s already doing it! I love her characters (well, there was that one lawyer who hogged the parking, but that was quite a while ago); they, and Sharon herself, are real, with life changes, with wit, with vulnerabilities. Bravery only matters when you’re afraid of what you’re asked to do; Sharon tells us about every fear, every “I’m staying in bed” kind of day, and she goes on to do whatever must be done. Thank you, Marcia — you’ve given me a great deal. I have no doubt this book will be fantastic. Muller never lets us down. Marvelous characters and the stories get better all the time. I can’t wait till it comes out. I was having Sharon McCone withdrawals.